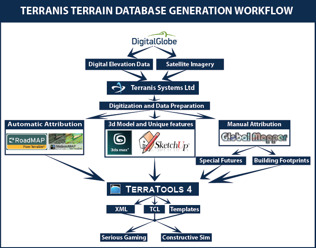 Additional necessary Source data classification is provided by several Subcontractors to Terranis Systems. By re-using existing workflows and Templates in , Terranis Systems can offer very quick development times for high fidelity correlated databases. Demand for an correlated database 20x20km in an contested area comprising of Vegetation, Low-Walls, high-Walls, Buildings whit interiors and whitout interiors, Streams, large rivers, HESCO-barriers, 12 surface materials, FOB and Street-signs database for VBS , SBPro, OpenFlight was delivered to the end-user within 2 weeks form order confirmation.